In case you haven’t had your heart’s content of autumn-themed foods and drinks, prepare yourself for the best fall treat to come out of 2018 – Trader Joe’s Pumpkin Spice Cream Liqueur. Yep, you read that right: TJ’s has combined pumpkin spice flavors and alcohol for the most beautiful partnership in all the land. You are cordially invited to sip this limited Cream #Liqueur. * It presents with warm vanilla on the nose, followed by the flavors of smooth #pumpkin & rich caramel—with a host of seasonal spices on the finish. NOTE: sipping may induce flannel wearing, leaf raking, and/or a sudden urge to bake something with #traderjoes Pumpkin Bread & Muffin Mix. *Available at TJ’s where spirits are sold—while supplies last. Pumpkin, caramel, AND vanilla? Sign me up! With 12.5 percent alcohol by volume, Trader Joe’s Pumpkin Spice Cream Liqueur can be consumed by itself or as a perfect mixer with rum, vodka, or a boozy, hot latte. Maybe enough of it will even get you tipsy enough to forget that the liqueur is a limited edition item, so once your local TJ’s is out, all you can do is pray for its return next fall (or search all the stores within a 50-mile radius to find more and stock up). This alcoholic delight isn’t the only autumnal item you’ll want to snag during your TJ’s run. This fall, the grocery store brought back some seasonal favorites like Pumpkin Bread and Muffin Mix, Spiced Cider, and Autumnal Harvest Pasta Sauce. Some of the newer, limited quantity additions range from the sweet and savory Caramel Apple Flavored Granola to the crunchy and sugary Candy Corn Popcorn to my personal favorite, Apple Cider Donuts that have real apple cider in the batter. You can also find some non-edible fall favorites at Trader Joe’s like decorative gourds and mini pumpkins, honey-crisp apple and vanilla pumpkin scented candles, and cinnamon brooms. You can even buy your pup Trader Joe’s Pumpkin Flavored Dog Treats to ensure that everyone is in full fall spirit — the treats contain actual pumpkin and cinnamon! If you’re the kind of person who buys a bunch of fall ingredients but never knows what to do with them, fear not, for Trader Joe’s has countless fall recipes on their website and social media. Craving something sweet? Try Pumpkin Madeleine Cookie Sandwiches. Want an appetizer to match the changing leaves? Spend less than an hour making Vanilla Maple Butternut Squash. All out of pumpkin liqueur but still thirsty? Grab some TJ’s sparkling cider and ginger beer to make a Fall Sparkler. So, get out and grab a bottle or two of that pumpkin spice liqueur. 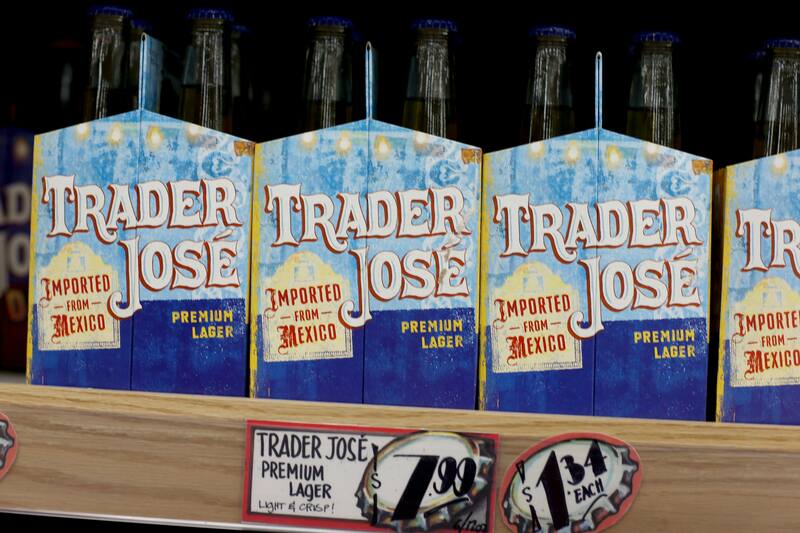 While you’re at it, don’t forget to check out other seasonal options at TJ’s. Whether you’re craving something salty or something sweet, something spooky or something cozy, Trader Joe’s will definitely have a treat for you among their new and old fall faves. Happy boozing and eating!